Wash the quinoa well, two or three times. Boil the water over high heat and add the quinoa when it begins to boil, lower the heat, cover the pot and let cook for approximately 13 minutes. When they’re ready, remove from the heat, stir with a fork, cover again and let sit for 15 minutes. In the meantime, combine the ground turkey, onion, egg, salt, thyme, garlic, pepper and parsley. Mix until everything is well combined, cover and refrigerate while the quinoa cools. Preheat the oven to 450°F. Cover a baking dish in wax or parchment paper. After 15 minutes, remove the meat mixture from the fridge, and then add the quinoa and half cup panko or bread crumbs. Mix until everything is well combined. 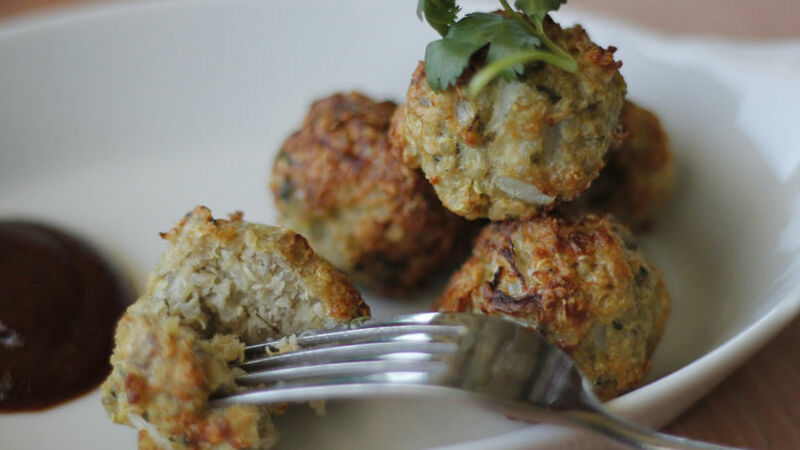 Form small balls that are approximately 1 inch in diameter and place them in the baking dish. Bake for 30 minutes, but check on them after around 20 minutes in case they need to be turned to brown evenly. Serve with your favorite sauce or dip. You can make double the amount and freeze them to eat later. You can serve them with marinara or pasta sauce. Quinoa has become very popular lately. Called “the mother of all grains” by the Incas, this grain is very versatile and can be combined with many other ingredients to produce both sweet and savory dishes. A friend introduced me to quinoa a few years ago and I’ve had a bag at hand ever since. Meatballs with quinoa are very easy to make and provides a complete meal for dinner, just add a salad and some fruit and you’ll have a happy family. You can also prepare them and pack them as lunch for your children, for example. They taste great hot or cold with a dressing. My 6-year-old son gobbled up 5 of them as soon as I was done cooking. My plan is to make double the amount next time so I can put some away for his lunch. I hope you like them!